Content focused minimal typographic theme. 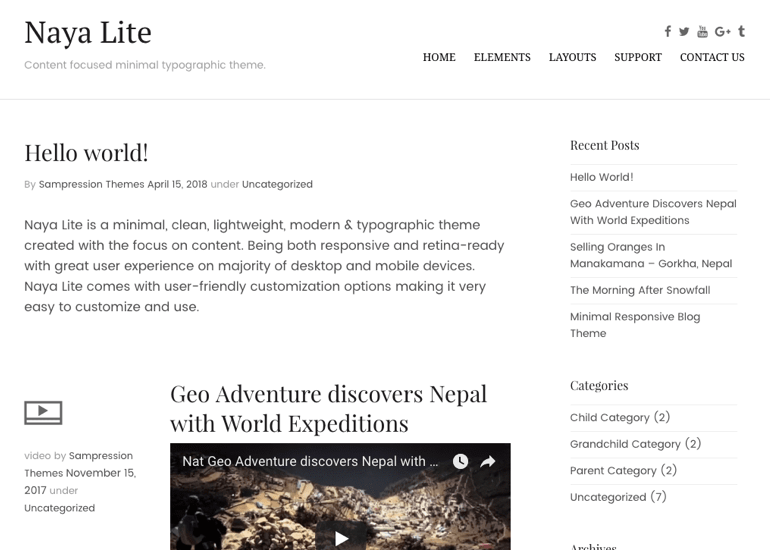 Naya Lite is a minimal, clean, lightweight, modern & typographic theme created with a focus on content. Being both responsive and retina-ready with great user experience on majority of desktop and mobile devices. Naya Lite comes with user-friendly customization options making it very easy to customize and use. 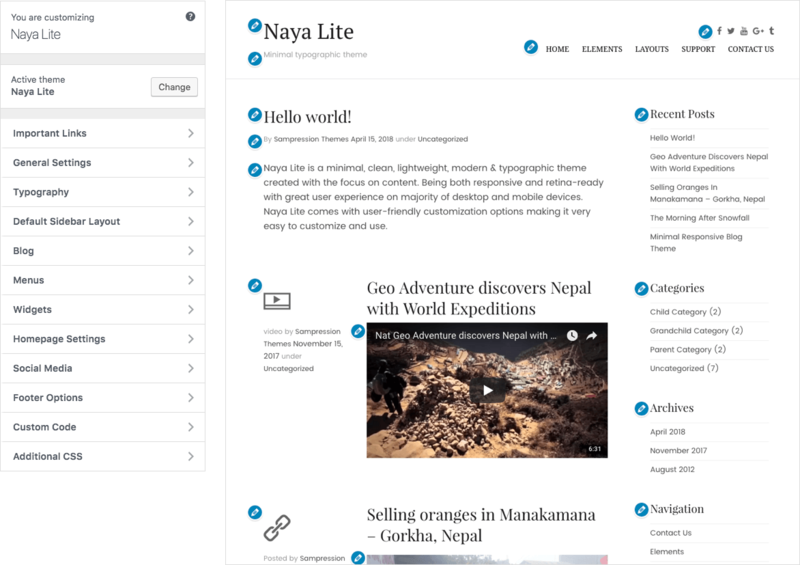 The Naya Lite Theme Customizer is packed full of design controls and features for setting up the styles of your website, including header styles, typography styles, footer, default colours, social media, default layout and so much more. Upload your custom logo & favicon with a few simple clicks. If you are just getting started, our theme also supports text-based logos. You can change your blog layout in seconds. You can set left sidebar or right sidebar along or set it to full width. We know that your website needs to be readable on all devices. Sampression Theme is fully responsive and looks great all the way down to even the smallest mobile devices and screen sizes. Our designers and developers follow the best SEO practices while developing each theme – we make sure search engine spiders like what they see when they are crawling your site. Material packed with .po & .mo files, which will help you localise the theme for another language. We have expanded the theme’s localisation to cover all aspect, of our theme. Our theme supports Right-To-Left (RTL) Languages to give you a full experience on languages of the world like (Arabic, Hebrew etc. ).